Happy Holidays! Make sure that you send love and joy this season by using Hallmark Greeting Cards to tell your friends and family how much you care! 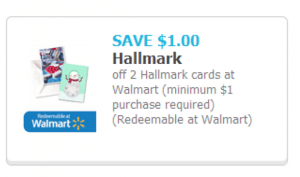 Click to save $1.00 off of a two Hallmark Greeting Card purchase at Walmart, minimum $1.00 purchase required. Take advantage of the savings and #SendHallmark this holiday season! Consumer: Coupon valid at participating retailers in the U.S.A. on any purchase of two Hallmark (including Sunrise) and Connections from Hallmark greeting cards totaling $1.00 or more from participating Walmart stores. Not valid for online purchases. Limit one $1.00 savings per coupon and one coupon per customer. Coupon must be surrendered at time of purchase. May not be combined with other offers, including coupons and promotional merchandise. Excludes gift enclosures and packaged and boxed cards. Not valid on gift card purchases or past purchases. See store for any additional exclusions. No cash value. Tax not included. Offer may be cancelled or modified at any time. This offer is exclusive for you; coupon may not be redistributed. Internet distribution strictly prohibited. No photocopied, photographed, scanned mechanically or digitally reproduced or altered coupon accepted. Coupon fraud is punishable by law. DO NOT DOUBLE.